March 3, 2010 -- Environmental historian Dr. Jared Farmer will present a free public lecture, “The Global in the Local” at Arkansas State University on Tuesday, March 9, at 4 p.m., in the Mockingbird Room of the Reng Student Services Center/Student Union, 101 N. Caraway Road, Jonesboro. His visit is sponsored by the Heritage Studies Ph.D. program and the Department of History. 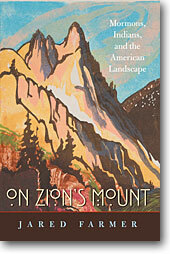 Dr. Farmer’s most recently published book, “On Zion’s Mount: Mormons, Indians, and the American Landscape” (Harvard University Press, 2008), has won four awards, including the highly prestigious 2009 Francis Parkman Prize from the Society of American Historians. In May 2007, Dr. Farmer accepted a tenure-track assistant professorship in history at Stony B rook University, a campus of the State University of New York. Dr. Farmer’s history position is affiliated with a new center, the Consortium for Inter-Disciplinary Environmental Research (CIDER). This initiative was undertaken to bring together the many faculty at the university from diverse disciplines, housed in many departments, to create synergistic collaborations that could address large, complex environmental issues. (cmilner@astate.edu), director, Heritage Studies PhD program and professor of history, at (870) 972-3509.